Posted September 23, 2015 by Jackie McMillan & filed under Bar, Bar Food, Booze, Eat & Drink, Jamaican. Bright, sunshiny colours and a cosy, welcoming interior transform this difficult corner space into the type of spot you’ll probably enjoy spending time in. Throw in a waitress with a Caribbean grandmother, and you’ll soon have the toasted coconut topped Bowl of Corn ($8) and vibrant, soupy Callaloo Greens ($8) on your table, with some idea about how to eat them. Hint: they’ll brighten up your Grilled Jerk Chicken ($18), but are also good enough to simply say: hell, hand me a spoon! Snapper Ceviche ($20) accentuates lovely fresh snapper with hot sauce. Another hot sauce highlight is their house-made habanero guava – fruity, hot and exciting – and for everyone else there’s jerk mayo. 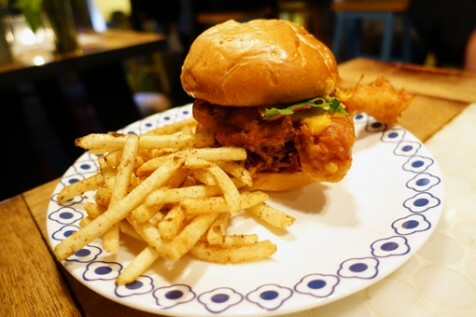 Smother ‘em over the fries that come with your Soft Shell Crab Burger ($18). It ain’t first date material, but it’s a juicy blast of deep fried crustacean barely contained between two soft, golden buns. The kitchen outpaced our rum-based cocktail selections, so get a Red Stripe ($8) to tide you over. If I’m truthful, beers may make the better eating companions. The aptly named Campbell’s Sip ($19) with Pampero dark rum; Floyd’s Old Fashioned ($22) made on Ron Zacapa 23 year old, and even the Kingston Sour ($18) with Appleton Estate V/X, all functioned better as post-dinner sip’n’savour drinks to me.